I have a client for whom we’ve done a fair bit of work previously. 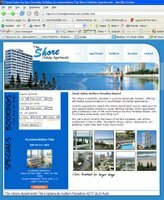 The client has a Gold Coast holidays web site that he hasn’t performed so well. We’ve just started today on the site and have begun by editing just the Home Page. The good thing is the client has another resort web site and we can do some great A/B testing of various strategies (such as use different booking systems) to see what works best. The fact that I’m excited about this opportunity means I must be a complete marketing and web nerd. Anyway, if you’re after a Gold Coast holiday check out Terry’s site. That’s interesting – do you find it conflicting that your client has 2 sites competing for rankings? Oh no – he owns both sites and now we’re working on both sites. So all is fine there. I’m in a spot right now where a client has 2 websites and I can’t for the life of me justify why we shouldn’t consolidate to one site and focus our efforts there. Hopefully I’m making more sense than my previous comment. Sure, there is a downside to having 2 sites – more work, more expense, competing against yourself. But it’s a great opportunity to do some testing of what works – different price points, different shopping processes, different copy, different photos, etc. Once we finish testing there will probably be a good argument for consoildating to 1 site. There are lots of cases where having 1 site would have more sense from the start. But not in this case.